Once you’ve watched that, let’s rewind to Hillary Clinton’s interview on the View where she said that an unborn baby, EVEN ON HIS/HER DUE DATE AFTER NINE MONTHS OF PREGNANCY, has no right to life. Now watch the clip of that baby in its birth sac again – because that’s what a baby looks like at 9 months in the womb – and try and make a case for Hillary’s views on abortion not being extreme and barbaric. A case for her views being ‘anti-woman’ can also be made. 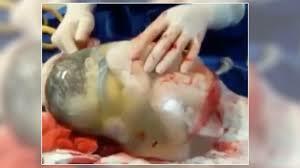 Abortion guts the mother. Research shows they suffer with it for the rest of their lives. Likelihood of depression and suicide increases. A lot of them, if they could go back, wouldn’t do it. It’s heartbreaking. That’s why I can’t stand the dishonesty in supporting it, and even celebrating it like they did at the Democratic National Convention. The president of NARAL was cheered and applauded when she told everyone that she had an abortion. “I did what was best for me” she said, and the crowd at the DNC erupted into applause. Promoting and celebrating abortion confuses the young women watching and makes them think that it’s normal, fine and ‘just a quick procedure.’ They only find out afterwards that it was not a normal little procedure, and they will never be the same. Abortion leaves two victims – one dead and one wounded. It’s not to be celebrated and cheered. Hillary Clinton’s position is extreme, barbaric and it’s anti-women.